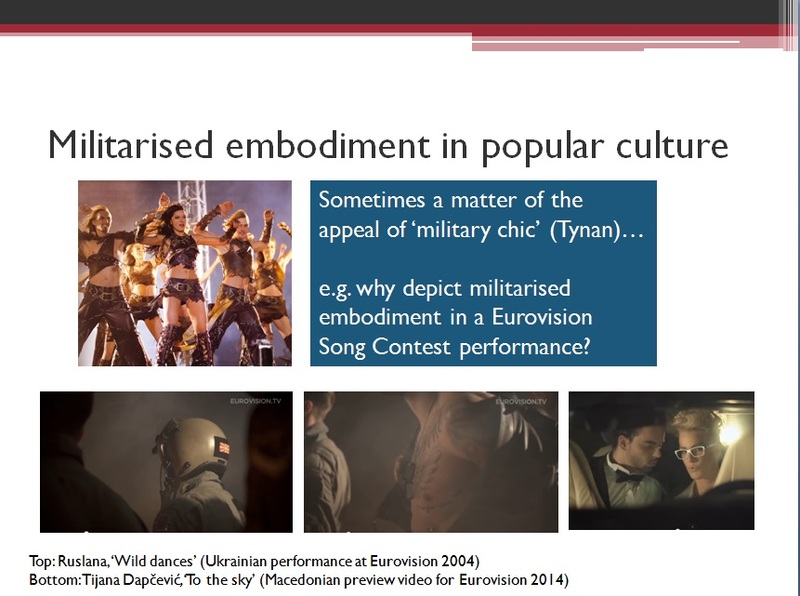 Over the last couple of years I’ve been revisiting some of my popular culture work, and indeed some of my interview-based research, by thinking about the concept of ’embodied militarism’ in the emerging field of Critical Military Studies – specifically, how bodily practices and representations of the body reflect and shape imaginations of war inside, around and outside actual armed forces. In recent years interest in embodiments of militarism, and more generally in embodied experiences of war, has crossed from history and literature (think of Elaine Scarry’s book The Body in Pain or Joanna Bourke’s Dismembering the Male) and sociology (John Hockey’s sensory ethnography of the infantry) into International Relations (through works such as Kevin McSorley’s War and the Body edited collection or Christine Sylvester’s War as Experience). Importantly for me, this approach incorporates both the lived experience of war and the fictional or fictionalised representations of war that appear in popular culture – joining together both sides of my research interests in a way that I used to find hard to express. At the International Studies Association conference this year, I was part of a panel on ’embodiment, experience and war’ where I talked about the process of writing about militarisation and embodiment – something I’ve been thinking about since a discussion I had with Synne Laastad-Dyvik during ISA last year. She and McSorley (plus Jesse Crane-Seeber and Lauren Wilcox) were also on the panel, with Sylvester as our discussant, and I took the opportunity to think further about what we communicate and what we ourselves might do or sense when we write about embodied experiences of war or mimetic representations of them. Do we need to worry, for instance, that something about embodied, sensory experience is being lost when we write about it (especially in the format of academic writing)? In the panel, I suggested that we could think about it less as loss and more as translation – which lets us see what Translation Studies’ close engagement with the process and politics of translation could bring to thinking about this common concern of ours. And now we’re back to the concern with the social positioning, agency, visibility and ethics of translation (and interpreting) that Translation Studies has been showing since the 1990s. Mona Baker and Anthony Pym, for instance, have both written on what the ethical responsibilities of translators might be; even though they interpret them differently, they’re still both concerned with how an intermediary uses the power that comes from their understanding of how to communicate in a source language and a target language at the same time. The choices translators make – what to translate? how closely to accommodate the audience expectations? how strategically to unsettle those expectations through translation? – are all, as Gayatri Chakravorty Spivak’s essay ‘The politics of translation‘ sets out, political – not least because the intermediary is always part of some kind of relationship of power towards the source-language audience(s) and target-language audience(s) they are responsible to. Other fields – ethnography, postcolonial theory, feminist theory and oral history to name a few – may be further ahead in considering positionality, power and trust during the writing process, but there’s a useful focus on the how as well as the why, what and who of writing that Translation Studies puts into the spotlight (at least for me, after several years researching translation/interpreting and ‘language support’ in peacekeeping operations, when Translation Studies was part of the conceptual framework the research team I belonged to was working with). 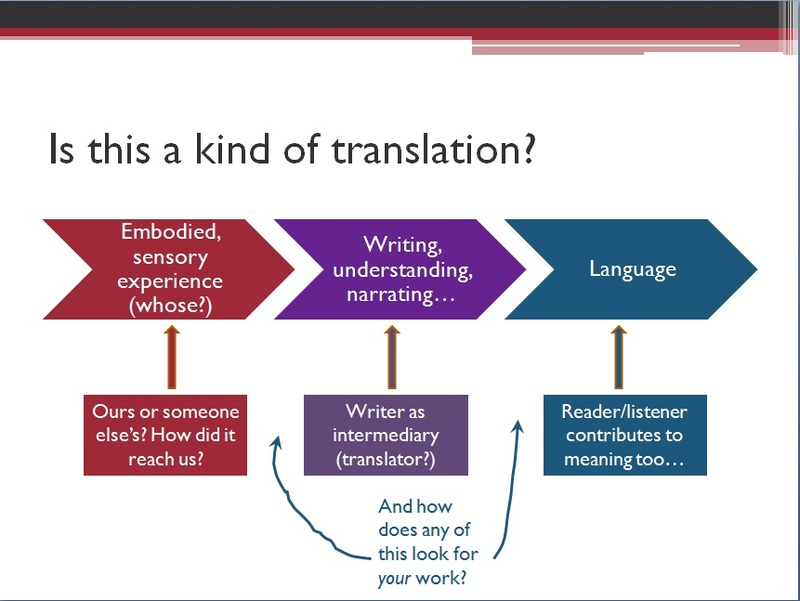 It’s also interesting to compare writing about embodiment with the problem of screen translation or audiovisual translation; in some ways, it puts you in the same position as a subtitler. Henrik Gottlieb used the phrase ‘diagonal translation‘ to describe what subtitling does: it has to translate from one language to another, but also from one set of senses to another (speech you hear into writing you read – but staying associated with images you see), within a restrictive set of technical conventions for how much text can appear on screen and once and how long it’s supposed to stay there for. Subtitling, necessarily, compresses meaning: the diagonal translation, as David MacDougall writes in Transcultural Cinema, ‘distils out of a range of implicit or possible meanings certain explicit ones’ (p. 174). This is more or less where I’d got up to with the ISA paper when Mona Baker visited Hull to give a seminar on her new research about activist subtitling and the Egyptian Revolution. The activists she worked with have tried to translate in ways that already express changes they want to bring about and – while still restricted by some technical constraints – to experiment with format to convey more of the original than subtitling usually can (e.g. one video that moved subtitles around the screen to emphasise the rhythm of a protest chant). This was an occasion for me to rethink the instances of militarised embodiment that I’ve written about: if I’m worried that something about embodied experience is being lost when I write, is there anything else I can do to mitigate the effect of that compression of meaning? Thinking about how Saara Sarma has used paper collages of 2D internet parody images to build arguments about the international politics of nuclear warfare (as explained in her 2014 PhD thesis) – based on Sylvester’s theory of collage as a method where ‘‘[i]f there is a storyline […] “it” is one we [as the viewer] must provide’ (Sylvester 2006: 208), I started developing an idea I’d had in a footnote of an earlier version of the paper: is there anything I could do with video remix, for instance, that I couldn’t do with writing? But, if so, what? Although I originally meant to talk about writing about embodiment based on interviews and writing about embodiment based on popular-cultural texts, I found when I was putting the paper together I had far more unanswered questions about writing and popular culture research. This isn’t what I’d have expected if I’d thought about it. Interviews are the narratives of real people to whom I clearly have ethical responsibilities, and directly represent a person’s embodied experience of war; most of the cultural texts I deal with are audiovisual texts and performances, imagined representations at much more of a distance from what Sylvester and McSorley both emphasise is the core activity of war – injuring the body. They feel less real or material in an important way (though audiovisual texts need people to embody their characters in order to be produced, and have their own politics of production and labour; they’re not quite immaterial, either). But interview-based and fieldwork-based disciplines already have scripts for thinking about the writer as an intermediary of other people’s experience and the responsibilities that writers then have. Whatever the problem is, someone else has probably had it before, if only you know where to look. Working with/on audiovisual texts doesn’t free us of ethical responsibilities or detach us from our social positions relative to others – a point Laura Shepherd reiterated later in the conference during an excellent paper on the ethics of researching and circulating (or not circulating) viral internet memes – but, then, what responsibilities and positions are they? …and making the point that even as we critique the recirculation of images and narratives, they recirculate through us (and bring with them, often very problematically, their own invitations to desire and identify), I finished up wondering whether – like the activist subtitlers in Mona Baker’s research – there are ways narrative approaches that might help get at this point more successfully than I can do in academic writing. 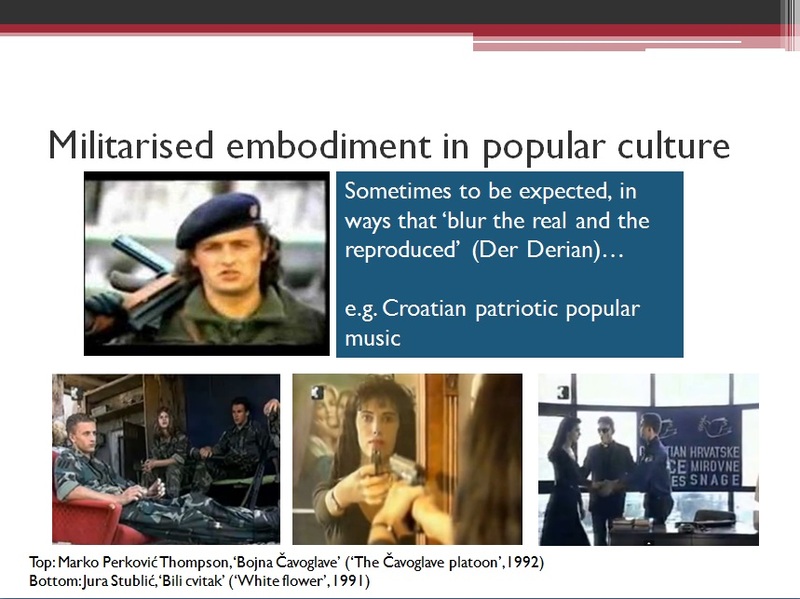 So far, the closest I’ve come to an audiovisual research output is the Powerpoint of looped and paired images I used a couple of years ago to illustrate a paper I was giving on representations of militarised masculinities and the Balkans in the film adaptation of Coriolanus. (Which eventually became an article itself.) 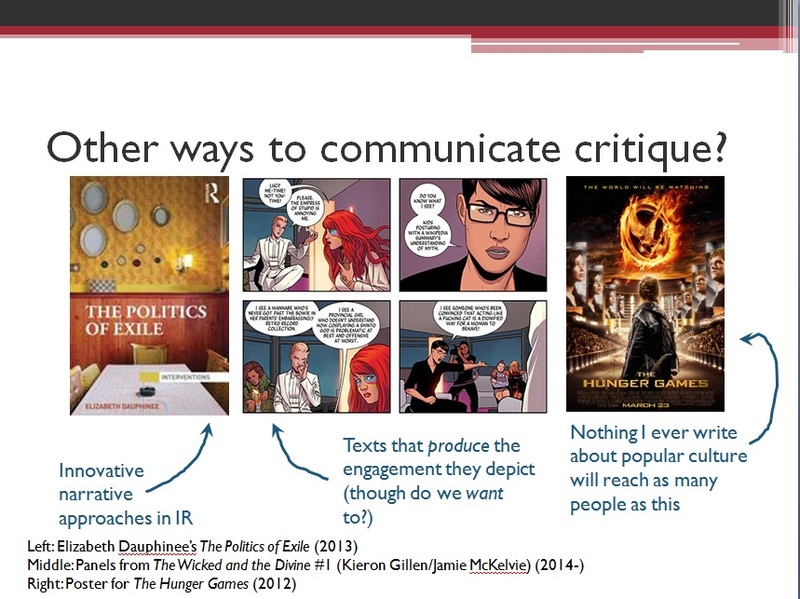 I’d seen Victoria Basham do this with one image per slide during a talk on popular militarism in the UK. For the Coriolanus slides (I’ll put up some of these in a forthcoming blog post about the article), I paired one image from the film and a news image from the Yugoslav wars in order to illustrate the points about resemblance, identification and recirculation that I was making, and had each pair automatically rotate behind me as I talked; it can’t convey all the information that a paper can, but is there anything a display like that can convey that an academic paper can’t, precisely because it forces the listener to take more of a part in making sense of what they can see? Feeling that this worked well but not quite knowing why, and being aware of what Sarma has already done with 2D collage, brought me to thinking about video remix. Outside the academy, this has already started becoming established as a tool in cultural studies pedagogy: Jonathan McIntosh’s ‘Buffy vs. Edward: Twilight Remixed‘, which edits footage from Buffy the Vampire Slayer and Twilight together into a scene between Buffy Summers and Edward Cullen to comment on Twilight‘s eroticisation of an abusive relationship, has had more than 3 million viewers despite being temporarily removed from YouTube in a copyright dispute. Craig Saddlemire and Ryan Conrad’s ‘A.V.A.T.A.R. : Anglos Valiantly Aiding Tragic Awe-Inspiring Races’, which mixes lines from Avatar with lines from 16 historical films to draw attention to the persistence of ‘white saviour‘ tropes in Hollywood film-making, has 40,000 but could still do with more. [R]ecent attempts to categorize remix are limiting, mainly as a result of their reliance on the visual arts and cinema theory as the gauge by which remix is measured. A more valuable view of remix is as a digital argument that works across the registers of sound, text, and image to make claims and provides evidence to support those claims. […] [A]rgument is key to academic efforts, and as such, the term holds resonance for the scholarly community. Remix can be a scholarly pursuit: it cites, synthesizes, and juxtaposes its sources. Argument also contains connotations of the dialogic quality of communication that is not anchored to either speech or writing, and so digital argument can extend its features to writing with sound and image in addition to words. But then, what sources are even mine to do things with, especially when I’ve been engaged in cross-cultural research? My gut sense is only those sources that I’m addressed by or maybe even that I’m marginalised by; but I’d like to see the fields I belong to do much more to develop the ethics of dissemination methods like these. And how, when we leave more of the meaning-making to the viewer, do we ensure that they can’t miss the critical engagement we want to bring about?